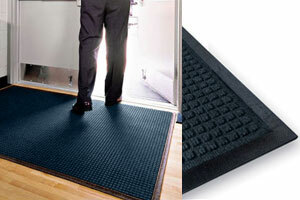 These navy blue commercial mats make great entrance carpets for doorways, retail stores and office lobbies. Each doormat measures 3' x 5' and is made of polypropylene fibers. 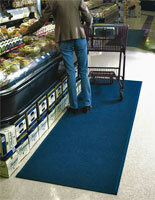 In addition, the commercial mats feature a rubber bottom that grips flooring and holds water and mud. 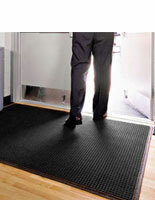 The entrance carpets feature absorbent polypropylene fibers that prevent floors lobby floors from becoming dirty. 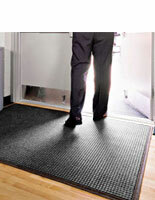 The mats have a raised ridge design that will reduce slips, making them a great addition to any office. This type of doormat is also anti-static rated at 1.2 KV by the AATCC. Please add 15 business day(s) when determining the lead time.